Liz:”Mummy, I wan to “wee wee”. So, we stopped at the petrol station. But, the 2 toilets were occupied. And, we saw the uncle went in to our ladies toilet. Yet, he never come out after about 15 to 20 minutes. Mummy:”Liz, can we go home and “wee wee”? Liz:”No! I want to “wee wee” now. How about you “wee wee” at the drain outside. In fact, this is not the first time. It happens few times ago when we can’t find toilet in the middle of the road while little Elizabeth just can’t hold her “wee wee” anymore. Is mummy doing the right thing? But, I just don’t want to let you suffer from holding your “wee wee”. That really ain’t easy. LOL! You showed such a bad tantrum yesterday as you refused to wash your body after you “Wee Wee” on mummy’s bed. Recently, you seems can’t control your “Shi Shi”. You started to “wee wee” on the cushion or bed, depends on where you are having your afternoon nap. That’s not a big problem to mummy. But it seems big to you. You get really frustrated! Felling shameful, disgusting or what? Obviously, we are both working hard together hoping you can fully leave the diaper pants aside. I knew you are working very hard now. There is no accident in the afternoon anymore. At least 2 months already. You have learn how to hold your “shi shi” and inform mummy much earlier than it’s too late. Excellent! Also, It’s been days you never wee wee on your diaper pants even though you wake up quite late. Yet, you manage to wake up in the middle of the night as you feel that you need to go to toilet since last night. It’s time to say bye bye to diaper pants. I know we can do it! With “ah Mah” — granny’s help, I started to “wee wee” in the potty. But, only when I am asked to at the right timing. I got trick actually. Initially, I thought it was a chair. I like chairs. So… It’s ok. Just forget about it! Hahaha….. But, it’s ok. Just make sure you don’t “wee wee” around the tv lift cabinet as there are wires around. That’s dangerous! Little Elizabeth is getting very shy nowadays. So, she likes to hide around when she “poop” or “wee wee”. Sometimes, I can’t even find the spots where she let go when I found her pants was wet. And, she can never sit down and “poop”. She always did it while standing. Weird, aye? Elizabeth normally “poop” 2 to 3 times a day. 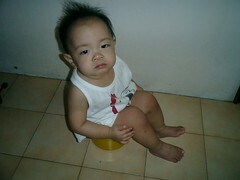 She has no constipation problem at all since she turned 1. Mummy is very happy with that. However, it’s kind of messy while traveling with toddler which “poop” 2 to 3 times a day, isn’t it? Somehow, mummy already get used to it. As she will be wearing disposable diaper whenever she goes out. So, mummy just have to clean her backside with wet tissues and throw the diaper away. That’s not complicated at all. Anyway, Elizabeth is already coming to 16 months old. However, she still don’t “pooh pooh” in the potty. Instead, mummy found out that she loves to poop in her “Mummy Poko” (diaper). 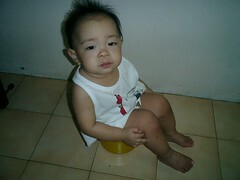 So, mummy never force her to sit on the potty anymore. I believe one day she will learn how to do it like us. Meanwhile, mummy want her to feel comfortable every time she “pooh pooh”. As long as she is not constipated. Anything is fine!